The Mobo Mini is an elite top of the line cruiser for children between 30 - 60 months old. The Mobo Mini features everything you're looking for in a young children's cruiser. With the Mobo Mini's versatile ride and attractive design, your kids can have fun and stay active. 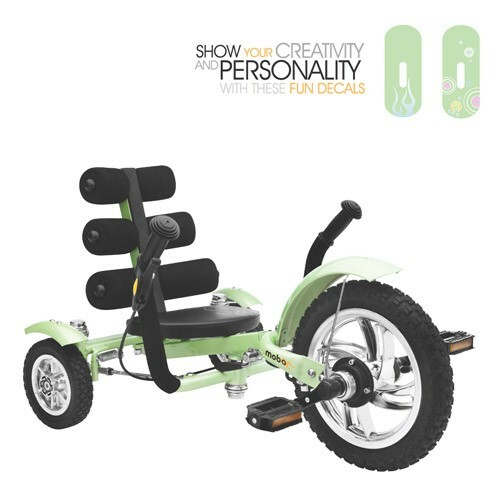 Due to its unique steering system, the Mobo Mini presents a development tool for hand/eye coordination and muscle strength at a young age, benefits that will have a lasting positive impact. Parents can shake their stress away because the Mobo Mini's sturdy material and comfortable seat ensures a safe experience on a durable ride. The adjustable frame allows the Mobo Mini to grow with your kids. It is the most memorable first bike in existence.